Qualcomm SDM450 Snapdragon 450 (14 nm). Octa-core 1.8 GHz Cortex-A53. MicroSD, up to 512 GB. 850 / 900 / 1800 / 1900 GSM. 850 / 900 / 1900 / 2100 HSDPA. Band 1(2100), 2(1900), 3(1800), 4(1700/2100), 5(850), 7(2600), 12(700), 13(700), 20(800), 38(2600), 41(2500), 66(1700/2100), 71(600) LTE. 160 x 77.7 x 8.1 mm (6.30 x 3.06 x 0.32 in). 172 g (6.07 oz). 6.2 inches, 99.2 cm2 (79.8% screen-to-body ratio). 1080 x 2160 pixels, 18:9 ratio. Yes - LG UX 7.0. 802.11 a/b/g/n/ac, dual-band, Wi-Fi Direct, DLNA, hotspot. 2.0, Type-C 1.0 reversible connector. Fingerprint (rear-mounted), accelerometer, gyro, proximity, compass. 3.5mm jack, DTS: X Surround Sound. Real Metal Frame & 2.5D Arc Glass. Hold on to premium comfortthe real metal frame complemented by gently curved 2.5D arc glass is as nice to look at as it is to hold. 6.2 FHD+ FullVision Display. Maximize your view, and your enjoyment on an FullVision display that delivers clearer picture quality, and a more vivid visual experience. Take shots with the subject in sharp focus, standing out against an artfully blurred background. High Speed Autofocus with PDAF. Capture clear, high quality photos of moving subjects with the high-speed autofocus technology you find in professional cameras. (PDAF : Phase Detection Auto Focus). DTS:X 3D Surround Sound. Experience sound in the most immersive way. DTS: X is premium, mobile-optimized technology that delivers louder, richer audio for movies, music and games. Like Verizon, Sprint, Boost Mobile, Virgin. Straight Talk CDMA, Tracfone CDMA, Total Wireless, Ting Wireless CDMA, Project Fi CDMA or U. 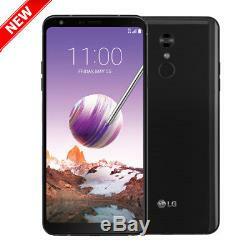 Even if the listing says Unlocked it will not work with CDMA Carriers. However, if the Listing Title says Verizon, only then this item will work on Verizon network. Other CDMA carrier as well. We will provide with USA converter adapter if needed. All common features and functions are still fully compatible in the USA. You can tap the screen and it would allow you to scroll up or down so the language can be changed to English. Our customer can have peace of mind and does not have to worry about any "additional or hidden" charges upon receiving the item. Applies when the item is sealed and return unopened. We strive hard for 5 Star Service Recognition. We're confident in our goods and services. We offer a wide variety of mobile phones, tablets, accessories, and gadgets. We strive for excellence and are not happy until you are satisfied. In addition, we have 1000s of satisfied local customers, including corporate / Fortune 500 companies. 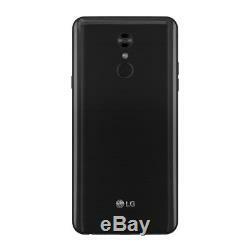 The item "LG Stylo 4 32GB T-Mobile LMQ710TSB 6.2 IPS LCD 2GB RAM 13MP Phone Aurora Black" is in sale since Thursday, November 15, 2018. This item is in the category "Cell Phones & Accessories\Cell Phones & Smartphones". The seller is "yumnatel08" and is located in Lombard, Illinois. This item can be shipped to United States, Canada, United Kingdom, Denmark, Romania, Slovakia, Bulgaria, Czech republic, Finland, Hungary, Latvia, Lithuania, Malta, Estonia, Australia, Portugal, Cyprus, Slovenia, South Korea, Indonesia, Taiwan, South africa, Thailand, Belgium, France, Hong Kong, Ireland, Netherlands, Poland, Italy, Germany, Austria, Bahamas, Israel, Mexico, New Zealand, Philippines, Singapore, Switzerland, Norway, United arab emirates, Qatar, Kuwait, Bahrain, Croatia, Brazil, Costa rica, Dominican republic, Antigua and barbuda, Aruba, Belize, Dominica, Grenada, Saint kitts and nevis, Saint lucia, Montserrat, Turks and caicos islands, Barbados, Bangladesh, Bermuda, Brunei darussalam, Bolivia, Ecuador, Egypt, French guiana, Guernsey, Gibraltar, Guadeloupe, Iceland, Jersey, Jordan, Cambodia, Cayman islands, Liechtenstein, Sri lanka, Luxembourg, Monaco, Macao, Martinique, Maldives, Nicaragua, Oman, Peru, Pakistan, Paraguay, Reunion.